www.cheersonline.com 44 • March 2015 striking drink toppers. For instance, the Pizza Connection ($15) has Nardini Ruta Aqua Vitae, Cocchi di Torino, Solerno and Nardini Amaro Bassano, with a dehydrated lemon chip fl oated on top to resemble a pizza. Head bartender Christopher James believes the "oversized swath of citrus" as a garnish is overdone: "It should only be used for certain drinks, not for everything with a citrus peel." Colin Anderson, bar manager at the 44-seat contemporary Mediterranean restaurant Cure in Pittsburgh, PA, agrees. "I think we were all getting sick of garnishing drinks one or two ways: either with a citrus peel or with a cherry." If bartenders do use citrus peels, Anderson says, they should trim the edges for a sleeker appearance. "It makes the drinker realize, in the slightest of ways, that the bartender cares about the look of the drink." Fresh herbs can add another dimension to cocktails: Anderson notes that herbs work wonderfully with fresh citrus, including orange peel and rosemary for rye whiskey sips, and lemon and thyme for gin. James is partial to fresh thyme, and also likes using rosemary that's slightly dried. IT'S COMPLICATED "Over-the-top, yet whimsical garnishes are really popular right now," says James. Jockey Hollow's Martini ($15) uses baby clothespins to hold a long lemon twist to the side of the glass. The concept's Teach Me How to Dougie cocktail ($15) mixes Purity vodka, Clear Creek Douglas Fir eau de vie and lime; a mizuna leaf fl oated on top resembles the Douglas fi r tree on the pine liqueur's label. "If [garnishes] have a certain level of whimsy, it kind of balances out the over-the-top factor." Matt Tocco, beverage director of the 200-seat Pinewood Social in Nashville, TN, has also seen a trend in over-the-top garnishes. He attributes this in part to the rise in popularity of Tiki bars and drinks. Pinewood Social's cocktail A Stranger in the Alps ($12) is made with Junipero gin, Carpano Antica sweet vermouth, Luxardo Bitter and Braulio Amaro. It's served with a long "pigtail" lemon peel twist wrapped around a chunk of ice, and drizzled with Clear Creek Douglas Fir eau de vie. "It looks a lot like a crown of thorns," Tocco says of the garnish. Any garnish "should be echoing, complimenting or mirroring other fl avors in the drink," he says. "It also shouldn't take forever to make." Cure has topped sips with components including candied fruit, caramel candies, Pop Rocks and agar gelatin pebbles, Anderson says. The restaurant's cocktail Gin ($10) uses Old Tom gin, riesling-based vermouth, preserved peach liqueur and catnip tincture. It's fi nished with a lemon wheel placed on the rim of the glass, along with a syrup of lemon oil, mint leaf and fragrant red agar pebbles. But what about the fear of a garnish looking too precious or ostentatious? 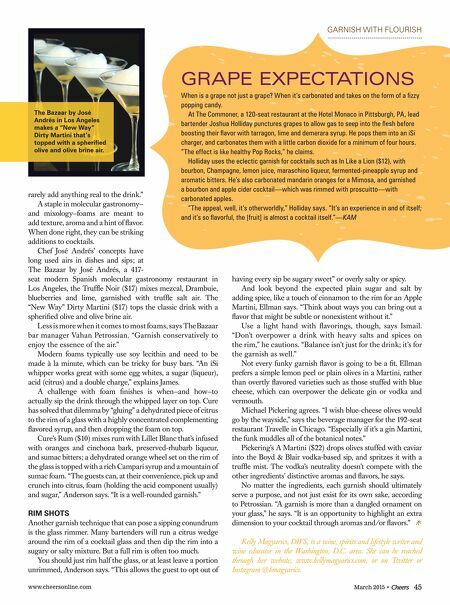 "If it complements and enhances the drink and one's senses, it will not come across as pretentious," says Anderson. 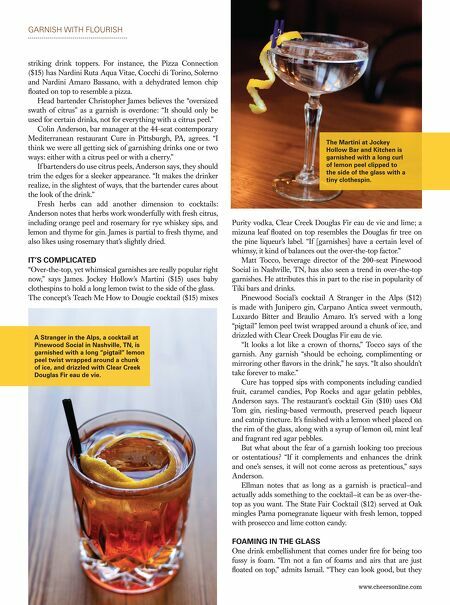 Ellman notes that as long as a garnish is practical—and actually adds something to the cocktail—it can be as over-the- top as you want. The State Fair Cocktail ($12) served at Oak mingles Pama pomegranate liqueur with fresh lemon, topped with prosecco and lime cotton candy. FOAMING IN THE GLASS One drink embellishment that comes under fi re for being too fussy is foam. "I'm not a fan of foams and airs that are just fl oated on top," admits Ismail. "They can look good, but they A Stranger in the Alps, a cocktail at Pinewood Social in Nashville, TN, is garnished with a long "pigtail" lemon peel twist wrapped around a chunk of ice, and drizzled with Clear Creek Douglas Fir eau de vie. GARNISH WITH FLOURISH The Martini at Jockey Hollow Bar and Kitchen is garnished with a long curl of lemon peel clipped to the side of the glass with a tiny clothespin.